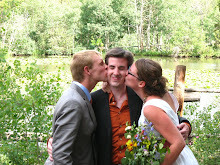 Paul and I decided to get married after 9 years of being together one sunny September evening after work. There was no flashy proposal and no big build up and then we went to my parents' house and celebrated with pizza, while calling everyone we know. 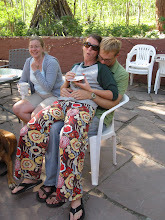 This casual approach to getting married pretty much sums up our entire wedding--and I wouldn't have had it any other way. We had a pretty small budget--about £2500. In the end, one of us said, "I wish we could just go on holiday and come back married," and the idea was born. We always go on city breaks to Europe--it's our favourite thing to do and I am always counting down the days until our next one. When we realised that we could get married abroad, it all fell into place--the idea was so us and it instantly made me smile instead of anxious! Our parents loved the idea--I think they were always worried we'd just run off an elope, but it was very important to have our closest family and friends there. So, we decided to get married in Sorrento, Italy. In all honesty, I picked this destination pretty randomly as we had always wanted to go there, it was beautiful, and none of the guests we invited had been either. I literally booked EVERYTHING online. We had never been to Italy or visited Sorrento until we turned up three days before the wedding, but I knew everything would be fine! I even bought my dress from ebay for £70. I put so much faith in the internet, but it all paid off. The idea of getting married in Italy may seem daunting, but it's actually very straight forward for a civil ceremony, for both UK and US citizens. We hired a planner to help us with the translation and organisation of documents and town hall timings, but other than that I did it all myself using information online and lots of emails. I 100% recommend hiring someone who can translate for you--it takes out all that stress. Italian paperwork is a bit of a nightmare--they are slow to get back to you and approve your documents, but it all turned out fine and with plenty of time. I honestly suffered no stress through organising the whole wedding online. I arranged the restaurant where we ate a fabulous meal after the wedding and contacted a local Italian photographer to hire for a couple of hours. Although I didn't have the help of the translator for these parts, we got there in the end and muddled through with a mix of Italian and English! Obviously you can hire someone to arrange these things for you, too, but I was convinced the internet and I could pull it off (and did). We got married in August 2010 at 5,30pm in a Medieval Cloister, with our 9 guests in attendance. The civil ceremony was in Italian and English and we had beautiful readings from my sister and best friend. The wording of the civil ceremony was based around partnership and it was so perfect for us. The day of the wedding was exactly as we wanted it--we spent the day together slightly nervously, with family and friends eating ice cream and drinking coffee in the Piazza--no stress and no regrets! After the ceremony, Paul and I walked through the old town with the photographer. This was a complete surprise, but it was brilliant. Italians love marriage and we received so many good wishes and so much happiness from people in the town. After the photos we ate at Photo restaurant, where we had a brilliant meal full of local food. The whole day was exactly as we wanted it--no stress, our closest family members there and full of laughter and joy. I was so pleased that everything worked out perfectly as it was all planned online, which looking back could have been a bit of a risk! The planning process definitely brought us closer together as a couple. It gave us the opportunity to truly focus on our values and priorities in life and taught us how important it is to stand by these. 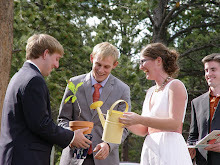 We wanted a small, civil wedding in a location that we loved, without 100 other people there. Although nothing went wrong with my crazy online-distance planning, we were also very casual and relaxed about it and any details. Our main focus was on getting married in a beautiful place, and being surrounded my friends and family, and I don't think anything could have really gone wrong with that! We didn't care about flowers or place names or seat covers-- just the marriage about to start. So, I 100% recommend getting married in Italy. I think a lot of people may think it's a great idea, but difficult and expensive. It truly isn't and it was significantly cheaper for us to get married in Sorrento than it would have been in the UK. We came in well under budget--the total ceremony, license, photographer, meal for 11, wedding clothes etc and flights came to under £2000. The Italian people truly love and respect marriage, and combined with the love from our friends and family, it was an unforgettable, perfect experience for us. Hannah works in marketing and Paul is a secondary school maths teacher. They met when they were 6 years old and started dating at 16. They live in the countryside in the UK with their two cats. They are constantly going on city breaks to Europe and have the next ones planned already. Hannah has a lifestyle blog called Smith + Scout, and she is realizing her dream of being a boutique owner and recycled event planner. 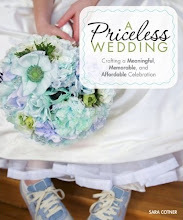 A huge thank you to Hannah for sharing her story with 2000 Dollar Wedding kindred spirits! If you have an idea for a guest post you would like to write, please send me an e-mail! REMINDER: Registration is now open for the next Purposeful Conception Course: Preparing Your Mind, Body, and Life for Pregnancy, which starts on June 5. Register today!